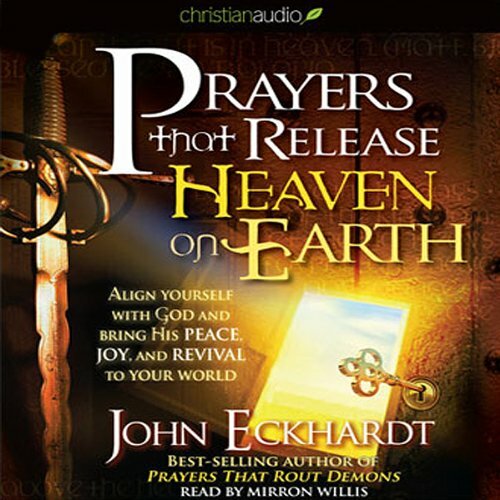 Would you consider the audio edition of Prayers that Release Heaven on Earth to be better than the print version? I would not consider it to be better. Just accommodated for those who rather listen. What was one of the most memorable moments of Prayers that Release Heaven on Earth? lol I want so much to speak on this, but do to non-believers I will limit my words. HEAVEN ON EARTH! All Good; literally! And we know, all good things come from heaven. WOW! Expect great things from this one, as usual with the rest of his writings. Apostle John Eckhardt,a man of God, pulls directly from the Heavenly Source. A true pleasure to know of Apostle J. Eckhardt it is indeed. I thank God for him!!! Yes. It compares him to be the same as he was with the rest; lead. So awesome! Mind blowing. As I listen over and over again...more is added. I love it! The narrator's performance is too theatrical. It seems as though the reading and the projection of his voice is "forced" and hard-pressed. The narration does not convey the anointing of the message of the book. The narrator is hard to listen to. I've tried more than once to engage in this book. The narrator is just too hard to follow. I would recommend purchasing the hard copy book first. I have the hard copy book which I have used daily for a few weeks. I purchased the audio book recently, which has been a great help.This book has been very effective in our home in various areas. I am thankful to have found this resource! !